Trinity College Dublin Students’ Union (TCDSU) have called a referendum on the issue of the University Times’ (UT) funding, which will be held during the last week of term. The referendum was triggered by a petition signed by over 500 students, which calls for the salary and on-campus accommodation given to the UT Editor to be cut, alongside a cut in production costs to €3,000. Campaigning will take place between April 8 and 11, with voting taking place on April 10 and 11, alongside elections for the Graduate Students’ Union sabbatical officer positions. The constitution of Trinity College Dublin Students’ Union (TCDSU) currently requires that the union make “provision of a salary for the editor only, granted on a monthly basis during term”. Similar to the other members of the union’s sabbatical team, the UT Editor also receives on-campus accommodation. The petition proposes an amendment to the constitution to state: “The Union shall not support the publication of the University Times in the following ways: (i) Provision of accommodation on campus during teaching term. (ii) Provision of a salary to any member of the staff of the University Times.” The proposal further suggests that the UT Editor submit and present a written report at each TCDSU Council. The proposed amendment retains the provision of an office and facilities for the newspaper, but seeks to remove the existing stipulation that an issue of the newspaper be printed at least once a month during each teaching term. It states that the union should provide “no more than €3,000 to the publication of the newspaper annually”. UT is currently under investigation by the Junior Dean for placing a recording device outside the apartment of Ben Arrowsmith, a final year Law and Business student who serves as President of the Knights of the Campanile. 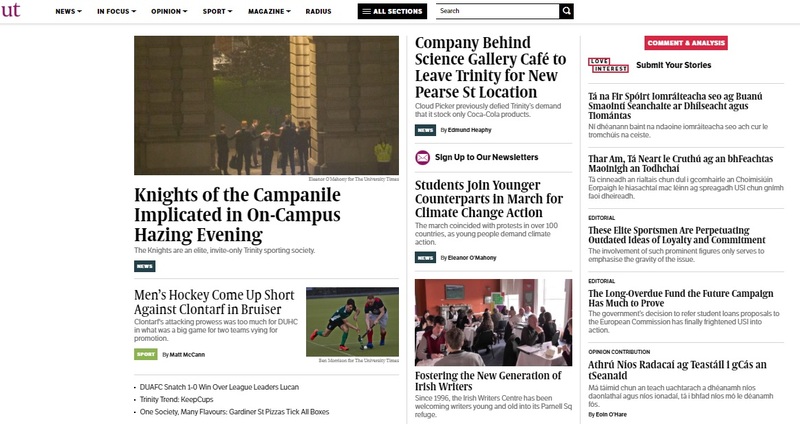 Information collected from the recording was then published in an article in the University Times implicating the society in carrying out hazing practices, after Trinity News requested comment for an article on the Junior Dean investigation. UT’s reporting methods sparked controversy on campus. The University Times have defended themselves in a series of articles where they cite various legal precedents for their actions. Three Trinity Law School professors responded in an op-ed in Trinity News to say that they do not believe UT’s legal defence holds up. An editorial published in Trinity News this week called for the resignation of Eleanor O’Mahony, the current Editor of UT. Donal MacNamee was elected Editor of UT for the 2019/20 academic year last month. His term as Editor will begin in June.